Topic: Qatar Situation: "Sarajevo 1914, Doha 2017?" An alarming headline from a Carnegie Foundation Graham Holdings Company outfit. But it is an interesting situation. We have a big airbase there and do lots of business and educational swaps with them. Lots of ex-pats living there. Also ironic- the Saudis frowning upon funding terrorist and radical groups. Lucky we have Rex as DOS head, as he knows all these players quite well. Re: Qatar Situation: "Sarajevo 1914, Doha 2017?" Some damn fool thing in Qatar, eh? Good post, albrecht. The US has more than an airbase in Qatar, we have our combined air operations center there that directs air assets from multiple nations over a significant part of the world. The Qataris have also been a steadfast and aggressive ally of the US going back to the Battle of Khafji in the Gulf War. Yeah. We don't have any Bismarcks around in power. Though I think fate granted us a bonus having Tillerson as DOS Head. He knows all the players and knows the importance of the region. I just hope the administration can stop with the anti-Iran, surround-Russia pro new coldwar, neo-con, Brzezinski (thankfully dead), Kissinger, etc crowd. "Not good" people in all of those countries and none trust-worthy but war is worse for everybody. We are too much in bed with the Saudis, me thinks, but a touchy situation. Also, even if not a war, the situation is dicey and effects a lot of the economy, war against ISIS, etc. "The World Cup always takes place during the European off-season in June and July. During this period the average daytime high in most of Qatar exceeds 50 °C (120 °F), the average daily low temperatures not dropping below 30 °C (86 °F). In response to this issue, Sheikh Mohammed bin Hamad bin Khalifa al-Thani, the 2022 Qatar bid chairman, has stated, "the event has to be organized in June or July. We will have to take the help of technology to counter the harsh weather. We have already set in motion the process. A stadium with controlled temperature is the answer to the problem. We have other plans up our sleeves as well""
Qatari Ambassador to the US telling CNN "the Russians" excuse. Trump needs to back off a bit and let Tillerson and Mattis have some talks with people instead of doing foreign policy on Twitter and changing opinions/views seemingly at random. "Assailants with rifles, explosives and women’s disguises stunned Iran on Wednesday with audacious attacks on the Parliament building and tomb of its revolutionary founder, the worst terrorist strike to hit the Islamic republic in years. At least 12 people were killed and 42 wounded in the pair of assaults, which lasted for hours and clearly took Iran’s elite security forces by surprise. The six known attackers also were killed, official media said, and five suspects were reported detained." I heard some guy on local talk radio today, talking about how Qatar is supposedly the greatest ally the US has ever had. It was hilarious. How many Qatari gave their lives in Vietnam? Just send more DU rounds, that worked out so well last time. It depends on which "US" the caller meant. Qatar has been very friendly with certain industries, companies, families, and even schools but nobody over there is really concerned about the US, in general or as a country, unless it serves their purpose for a time (that is, we will sell them arms, we will fight their wars, we will defend their shipping lanes, etc.) But they weren't even a real, independent country during much of the Vietnam war I think still under the British. Another one of those fucked up, excuse my French, fake "royal" "country" created by Britain post-Ottomans. The attack in Iran coming right after the announcement of the rest of the Gulf States suddenly kicking Qatar out (where the US has a large airbase and command center, business, and ex-pats) is certainly "interesting." Things like this attacks in Iran leads credit to my subject line, which I cribbed from that article, "Sarajevo 1914, Doha 2017." Might have something to do with the 7000 US military personel who are based there. Which might be awkward now. Wow. That's nearly four whole towers' worth. That's kind of like Art questions somebody commitment abilities to stick with it. I don't know who is in the right here, but Egypt and friends have made themselves look foolish. No sovereign nation could have possibly accepted the thirteen demands made on Qatar, and when they didn't it left the four countries no alternative short of war but to drop those demands. In a part of the world where loss of face is unthinkable and dealing from strength revered, little Qatar has emerged as the clear winner. Iran also benefits. My gut tells me nobody is in the right in that crazy, corrupt region. But I'm glad tensions seem to be deescalating somewhat. We don't need more destabilization or wars in the region, particularly between countries that, supposedly, are both our friends and allies. ""We are tired of responding to false information and stories invented from nothing," Sheikh Mohammed told Al Jazeera TV."" Sheikh Abdullah bin Ali al-Thani - who played a role in negotiating with Saudi Arabia during the Qatar diplomatic crisis last year - made the claims in a YouTube video released on Sunday. He claims he is being held by Abu Dhabi's Crown Prince, who will be "fully responsible" if anything happens to him. A UAE official denied the accusations. 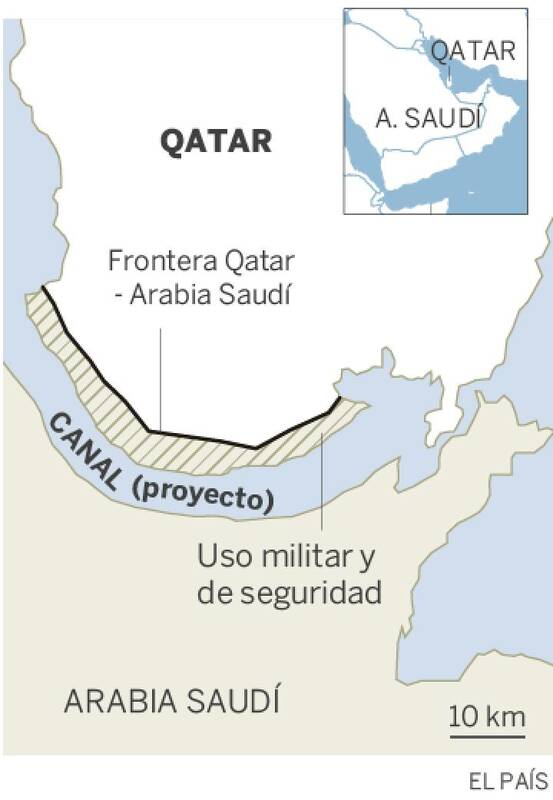 Not content with an economic and diplomatic blockade, the Kingdom of Saudi Arabia (KSA) has revealed a project for a canal that would physically cut off the peninsular Qataris from the Arabian mainland. The plan also calls for a Saudi military base and nuclear waste dump—on the Qatari side of the canal. In December Riyadh announced that it had definitively closed the Salwa border post, the only legal post between the two countries. Despite the pressure, the small but rich emirate (thanks to its huge gas reserves ) has managed to overcome the obstacles by strengthening its economic relations with Oman, Iran and Turkey. In fact, a report by the International Monetary Fund (IMF) last March concluded that the impact of isolation on the Qatari economy "is shrinking". The question becomes "why build a wall, when you can build a canal". Surely the Mexican canal is better than a wall? If true, the Saudis are more ambitious and crazy than we thought. ...and it's not a particularly new thing either. Sometimes you have to grasp that nettle - US Central Command be damned. 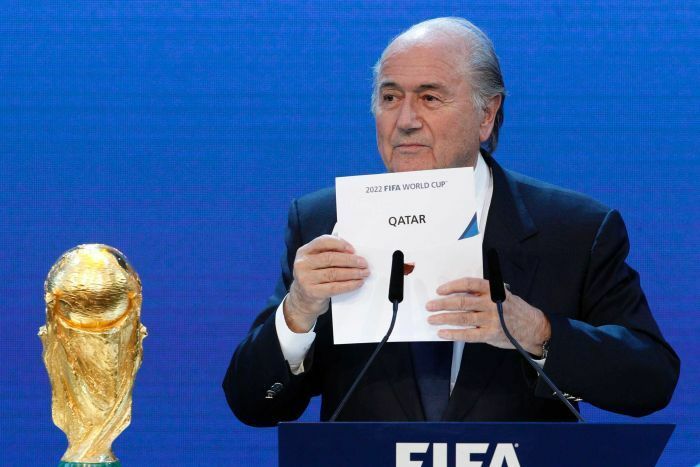 Fifa wants an expanded world cup in 2022 (earlier than planned), but that means Qatar would have to share matches with the countries that are blockading Qatar. The catchphrase of the 2019 Asian Cup is 'Bringing Asia Together', but that comradery was not in evidence in Tuesday's semi-final between Qatar and United Arab Emirates. Qatar won the politically charged match against the tournament hosts 4-0 to advance to its first Asian Cup final, but was forced to contend with shoes being thrown from the stands by aggrieved home supporters. It was the second goal of the match against the hosts that prompted the UAE fans to start throwing their shoes at the Qatari players, an act considered to be an insult. A regional boycott of Qatar, led by Saudi Arabia, has affected the team's logistics at the Asian Cup and made it difficult for the country's fans to attend games. The United Arab Emirates, Bahrain and Egypt are also part of the boycott. They also beat Saudi Arabia in an earlier game.